Pokemon Let’s Go might have a flavour all of its own, but it still leans on a classic RPG system of progression where the path ahead is blocked until you’ve acquired a certain item or ability. It’s not always straightforward knowing where to go in these instances – or even if the items are definitely required for the story – so here’s where to find things like Tea, the Silph Scope, and the Strong Push ability in Pokemon Let’s Go. If you’ve curiously searched for any of the items listed on this page, but are wary of spoilers, just know that you’ll eventually get each of them as you progress through the main story of Pokemon Let’s Go. So if for instance you’re wondering how to get tea for the gate guard as soon as you’ve left Cerulean City, just know that you’ll find it eventually during your adventure and head off into the Underground Pass. But if you’re stuck and after more specific help, do read on! As aforementioned, you can run into the thirsty guard as soon as you’ve beaten Misty and left Cerulean City. But you don’t gain access to the connecting tunnels quite yet – if you did, you’d be able to access gym leaders and trainers much more powerful than yourself. To get Tea for the Guard, you need to continue on to Celadon City. 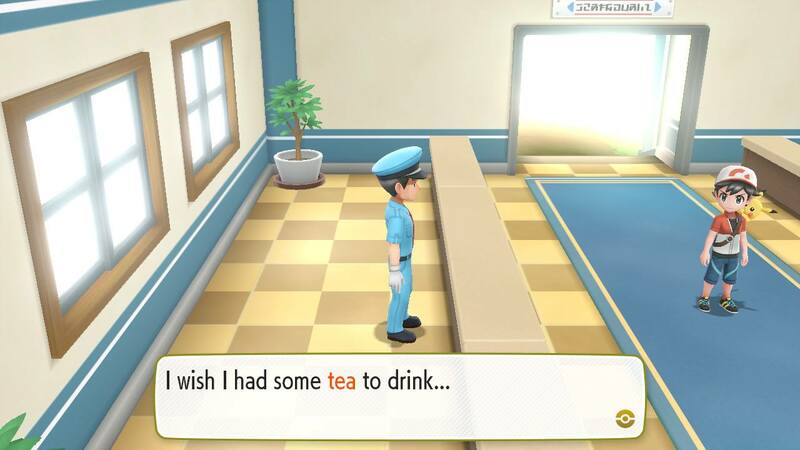 This will be familiar to veterans of the OG Gameboy games, where you had to grab a drink from the vending machine on the roof, but it’s a little easier in Pokemon Let’s Go. All you need to do when you reach Celadon is find your old friend Brock in the west of the city, near the Poliwrath. He’ll give you the tea that you need to get past the guard. First you need to get the chop down ability from the SS Anne and clear Vermillion City, before heading back up to Cerulean and through the Rock Tunnel. From Lavender Town on the other side head west, past all of the trainers, and through the second Underground Pass. The Silph Scope is another classic item from Pokemon games of yore. You’ll likely first hear of it when you reach the eerie Lavender Town and try to climb the Pokemon Tower. Things here – again – play out a little differently to how they did in the original Pokemon games, so, without spoiling too much, to get the Silph Scope you need to tail Team Rocket to Celadon City and clear out their secret hideout in the Game Corner. Defeating their leader will net you the coveted Silph Scope and unlock the rest of Pokemon Tower for you to explore at your leisure. Spoopy! Replacing the Strength HM, the Strong Push ability is vital to your progress in Pokemon Let’s Go. But once again it’s not straightforward knowing where to go to find it, and returning veterans will find they need to do something slightly different to find it than they did 20 years ago. To find Strong Push, you need to head down the cycle path to Fuchsia City. From there you need to speak to the Warden in his house to the right of the Pokemon Centre. He’s lost his teeth and needs your help to find them. All you need to do is go to the beach south of the Pokemon Centre in Fuchsia City and enjoy the cutscene you see there. Then once you’ve got the golden teeth, return them to the Warden and he’ll reward you not only with a set of clothes, but the Strong Push secret technique as well. For more on Pokemon Let’s Go, check out our guide to finding rare encounters with lures. And if you’re a shiny hunter, find out how to catch more shiny Pokemon with catch combos.